Saturdays with the Saints has established itself as a popular Notre Dame football pregame ritual that combines the university's rich traditions of Catholic faith and spirited game days. Notre Dame theology faculty and McGrath Institute staff will deliver dynamic lectures on saints chosen for their uncommon virtue and their willingness to let their faith stand in contradiction to the wisdom of the world. The lectures begin at 10:30 a.m. in the Andrews Auditorium on the lower level of Geddes Hall adjacent to Hesburgh Library. The talks are free and open to the public. Attendees are encouraged to arrive early as the events tend to fill to capacity. 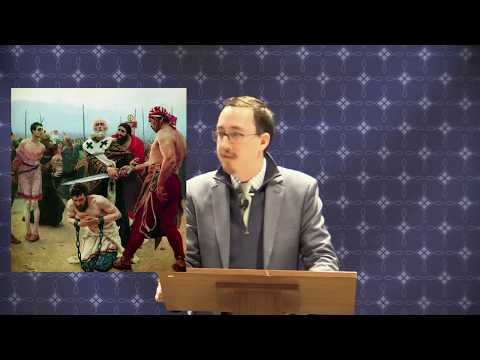 Gabriel Radle, Visiting Assistant Professor in Theology at the University of Notre Dame, presents on the life and cult of St. Nicholas of Myra. This lecture was the seventh lecture in the 2017 Saturdays with the Saints series.